A horrendous piece of manufacturing data from China sent the U.S. stock market tumbling yet again Tuesday, taking the price of oil lower along with it. Jim Cramer is hoping the price of crude heads higher, because many oil companies could be in real danger if it sinks any further. "Like I keep telling you, there is roughly $200 billion of debt from these oil companies on the high yield bond market, and when the price of crude is plummeting everyone starts getting scared that something terrible could be lurking in the world of fixed income," the "Mad Money" host said. That is why Cramer sought the insight of Carley Garner. She is a technician, co-founder of DeCarley Trading and colleague of Cramer's at RealMoney.com. Garner has a successful history of predicting the trajectory of crude on "Mad Money" and spotted the bottom in crude and the volatile events following afterward. So where does Garner think oil is heading next? Looking at the weekly chart of West Texas Intermediate Crude and the Commodity Futures Trading Commission's weekly Commitment of Traders report, Garner came up with a pretty stunning revelation. 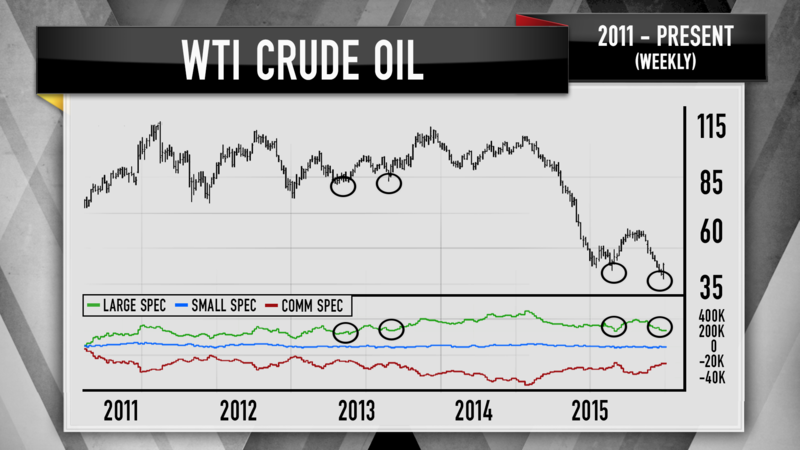 The CFTC report tells investors exactly how the major players are betting in the oil futures market, including the big institutional money managers who tend to drive the markets. Garner pointed out that during the recent decline in oil, large speculators unloaded approximately 40 percent of their bullish holdings. This is a good thing because back in July, big money was way too bullish on oil with a net long position of 328,000 contracts. Last week that dropped down to roughly 200,000 futures contracts. Garner thinks this is a wonderful sign for oil, as in recent years when net long positions on crude drop to that level the selling will dry up and prompt a rebound. "The fact that the big boys were throwing in the towel and capitulating right near the bottom is exactly why Garner now believes the path of least resistance for oil is higher," Cramer said. Essentially this could indicate that the commodity speculators who dumped their oil holdings during the last leg down will now rush back in to put their chips on the table. So even with oil's huge rally last week and Tuesday's horrendous decline, Garner believes that there could be plenty of buying power with money on the sidelines waiting to jump back in and prop up the price of crude. And while she cannot rule out another dip down to the low $40s or high $30s, Garner said as long as crude holds above last week's lows, oil will find its footing and continue to climb higher. Ultimately she expects it to recover toward $62.50, and if it breaks that level then she wouldn't be surprised to see it hit the mid $70s or low $80s.